Industrial Property Broker – used by the wisest property owners. When you look to rent or purchase a warehouse in any part of the world, a professional industrial property broker (industrial property agent) can be a very helpful comrade. The commercial and industrial property market is involved and could be expensive. There are also multiple legal, practical and sector-specific elements to understand. There are functional elements that require practical experience, and there are “paperwork” elements that also need experience. An industrial property transaction couples the practical aspects together in (usually) one comprehensive legal document. For all these reasons, obtaining the advice and help of those experienced in these matters is a logical and money-wise step to take. Also, with the proliferation of online property portals, many companies and brokers purport to offer superior opportunities. 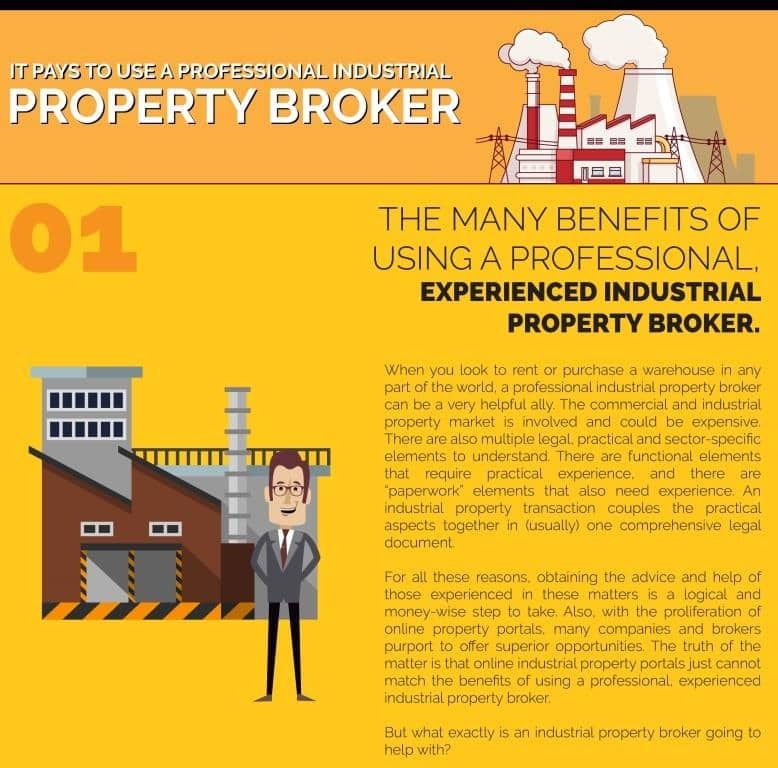 The truth of the matter is that online industrial property portals just cannot match the benefits of using a professional, experienced industrial property broker. But what exactly is an industrial property broker going to help with? Your local industrial broker knows more than you about the local industrial areas. It’s their business. They work with this every day. Drive around the area every day. Aware of the local landlords and the micro nodes – good and evil. Local brokers also understand the costs and the hidden secrets to property in the area. They also know the better the job they do, the more work they will win in the future. You will get to see many more options than you would working alone. Provided you choose the right local broker. The right industrial property broker will make it their business to dig out every single property that may be available. They will use all their endeavours, both online and business contacts. They will make sure the properties they show you are as up-to-date, most suitable and most comprehensive as possible. You access a whole host of choices using a broker that just aren’t visible if you go solo. Furthermore, most online portals host outdated information. This can be costly, frustrating and wastes time. The better property brokers in South Africa are generally, the more educated and experienced brokers. Most brokers have a tertiary education in the form of a degree or diploma which they acquired before being a broker. While the Estate Agency Affairs Board (EAAB) manages the initial education required to become registered brokers and ongoing desired core competencies, they are not educators. The EAAB primarily focuses on making sure brokers have their annual Fidelity Fund Certificates (FFC’s), and that Estate Agencies are audited on a yearly basis. The best industrial brokers are those who have a good mix of education and on-the-job knowledge in the industrial property sector. Using their knowledge of the local market, your broker (agent) works to ensure that any industrial property lease or purchase is indeed appropriate for your needs. What is the exact power requirements of the incoming business and the perfect power offering by the building? 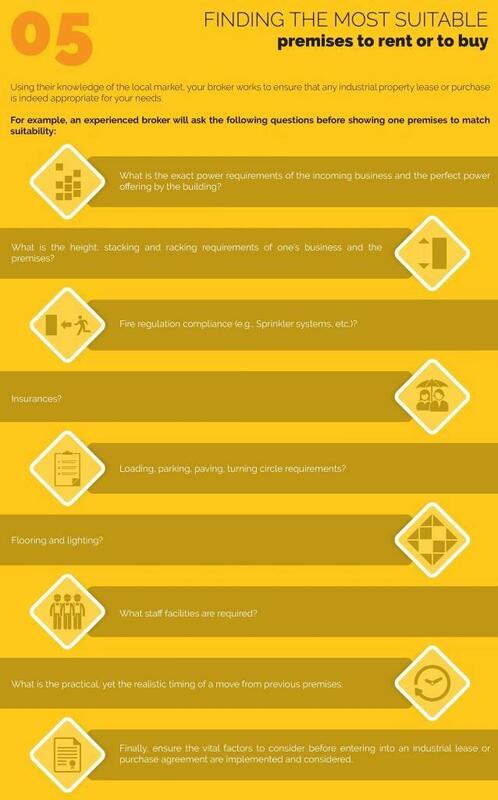 What is the height, stacking and racking requirements of one’s business and the premises? Fire regulation compliance (e.g., Sprinkler systems, etc.)? Loading, parking, paving, turning circle requirements? What staff facilities are required? What is the practical, yet the realistic timing of a move from previous premises? Finally, ensure the vital factors to consider before entering into an industrial lease or purchase agreement are implemented and considered. In the same way, the owner’s or seller’s agent is keen to get them the most advantageous transaction, your agent or industrial property broker must work to get you the best deal. They must leverage lower rent, better terms and fight to make your agreement the best it can be. There is, of course, nothing to stop you heading into the wilderness without a broker. But it is vital to understand you are about to enter a business jungle that has little patience with the uninitiated. It will not offer you special first-time treatment. If you go it alone, be prepared for some tough challenges. It is essential to marry the practical aspects of an industrial transaction with the exact wishes into a fair and reasonable legal document that respects the wishes of both parties. It is of paramount importance to look at the factors to consider when entering into a new lease agreement for industrial property. Once the lease contract has been signed, it’s hard to change or re-negotiate. Also, any areas shared with other users? (e.g., Shared yard areas). Rentable area of premises. The most commonly used formula is the SAPOA Method of Measuring Floor Areas. The exact use of the premises and facilities. Date of Occupation of the Premises. Renewal period and terms & date to be complied with for Renewal to be Valid. What other initial costs are to be paid by the Tenant?. (e.g., Security, Operating Costs). How/ when do these costs escalate?. How are consumption charges (e.g., Electricity, Water, Sewerage, etc.) calculated and billed?. Any individual/ additional requirements requested by the Tenant?. 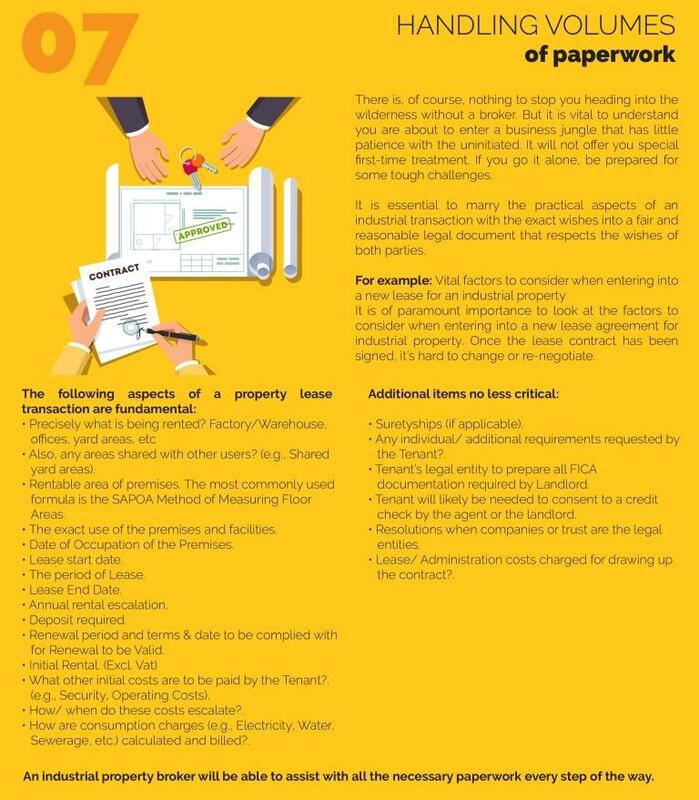 Tenant’s legal entity to prepare all FICA documentation required by Landlord. Tenant will likely be needed to consent to a credit check by the agent or the landlord. Resolutions when companies or trust are the legal entities. Lease/ Administration costs charged for drawing up the contract?. An industrial property broker will be able to assist with all the necessary paperwork every step of the way. Your broker will find information for you concerning the seller’s or owner’s motivation, prior transaction data, or other information that the listing agent may not or will not disclose. It might seem obvious, but brokers have your interests at heart. That goes a long way in such an expensive and competitive market. They may have landlords who are loyal to them, as they supply good tenants. It is far easier to negotiate a transaction through a broker than directly with a landlord. The truth is: negotiating in a specific industry is honed over years. Successful negotiation of a real estate transaction is stressful and in many cases time-consuming. A lot of negotiation is necessary for South Africa’s industrial property market. Let someone else take the strain. Other areas where brokers can help include their relationships, time management skills and their more extensive professional network, which we have already touched on. They can help you with anything from space planning and design to budgeting and valuation. The modern agent has a plethora of tools and abilities that are there for you to leverage. The broker has an interest in maintaining a long term relationship with yourself. Also, after a deal has been concluded they will be around to answer questions. Tenants and businesses can make use of a professional brokers network. Taking a quick look at the long list of frequently asked questions on most for sale by owner websites suggests the process isn’t as simple as many people assume. And when you get into a difficult situation, it can pay to have a professional on your side. In conclusion, this process is the same as going to court – you can use yourself, but if you want a good outcome – use a broker. Also, use a professional, experienced industrial property broker, just like using a good lawyer!